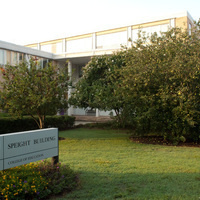 Speight Building houses the College of Education and offices of the ECU Teaching Fellows Program, the Model Clinical Teaching Program, and ENCCARE. It contains 22 classrooms, 45 offices, testing rooms, laboratories and related facilities. East Carolina University was founded in 1907 as East Carolina Teachers College, and today the College of Education continues to build on a century of experience producing world-class educators. What a great day meeting the advisers for SECU Partnership East and Instructors from the College of Education!